The airport of Lyon (the third biggest city in France after Paris and Bordeaux) was closed for all traffic after a man drove his car onto the runway whilst being chased by police forces. In the hereunder video, the white Mercedes car is seen careening across the dirt and onto the runway before the fugitive throws himself from the vehicle and starts running from police. Lyon Airport is now closed until at least 2 pm. Police say the man has been arrested. The car first entered the terminal of Lyon Saint-Exupéry airport by driving through the glass doors. The police are present in great numbers. It is so far unclear what the driver intended. A witness confirmed that the car raced through part of the arrival hall around 11.25 am. The car broke through one door and drove outside again through another door. Luckily no one was injured. 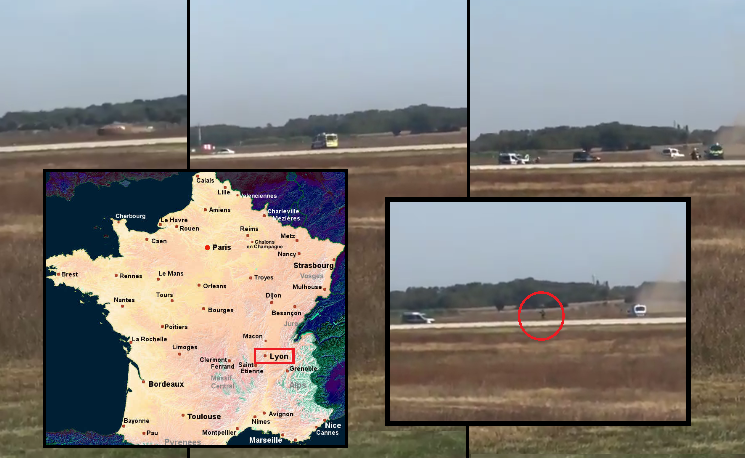 According to local newspaper Lyon Capitale, the car then went on the runway, followed by the police. The aircrafts present on the tarmac were stopped. Eventually, the car came to a halt and the driver, who tried to feel on foot could be arrested.